Yet what training has prepared you to run a business? E-Myth Real Insurance Store fills this knowledge gap, giving you a complete toolkit for either starting a successful business from scratch or maximizing an existing business’ performance. Loaded with practical, powerful advice you can easily use, this one-stop guide helps you realize all the benefits that come with a thriving insurance business. Wow What a Let Down!!!! Would you ever listen to anything by Michael E. Gerber and John K. Rost again? Hire a professional voice person. The author speaking is absolutely dreadful. Speaks way to slow and gravelly. If you could play editor, what scene or scenes would you have cut from The E-Myth Insurance Store? For sure the first 30min it wasted just to get through the acknowledgments. Are you kidding me! This book may be OK for complete beginners but if you have read more then a few business books so far skip this one. Title seems to be more of a marketing ploy then a book specifically aimed at helping those in the insurance business. Author drug out some points for an eternity when a simple analogy would have done fine. At some points I felt this book was just an ad for the co-authors insurance franchise business. Would you try another book from Michael E. Gerber and John K. Rost and/or Michael E. Gerber and John K. Rost ? I would try another from Michael Gerber. I enjoyed the few examples of systems John had used in his agency model. The least interesting was the duplicate information from the original E myth book. After reading the E Myth Revisited I was really excited to read this book as I am in the insurance industry and was looking to see what systems this author had used in his agency. However, I was disappointed in the small number of examples that were referenced in this book. The book seemed to be more of an advertisement for John's insurance agency franchises and less of an educational read for solid insurance agency systems. E-Myth revisit is a lot more helpful than this book for an insurance company. This was a waste of time. There is some decent information but hard to follow. I regret not buying this as a book. 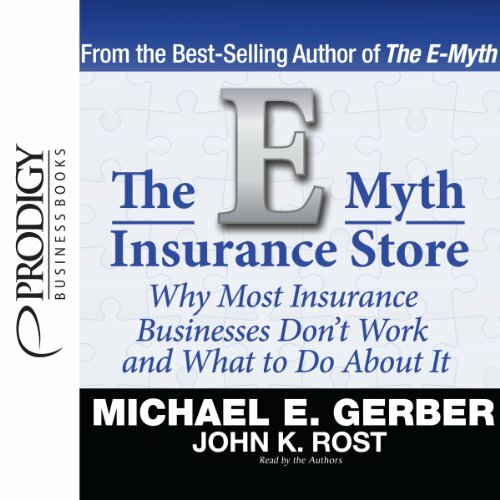 The E Myth Insurance Store as an eye opening book addressing the things a person that is looking to have a successful career and business in the insurance industry. There were real world examples of things you must know & take action on. Myself, each day is a learning experience and this book puts a lot of those things into perspective. I put E Myth in the MUST READ category! Why would you try to recreate the system, when it is provided to you here? This book combines what is great about the E-Myth concepts with the real life success of an Insurance Industry Rockstar. This book will help you focus on what works, while helping you to really assess what is it you want from your business. A must read. I really needed to listen to this life changing presentation. Thank you so much for helping me figure out my life with my company ! Not for the nay Sayers - only for those that want to win. I' think most of us have heard this before. Nonetheless it is still a great book. Apply these principles and watch your world change.